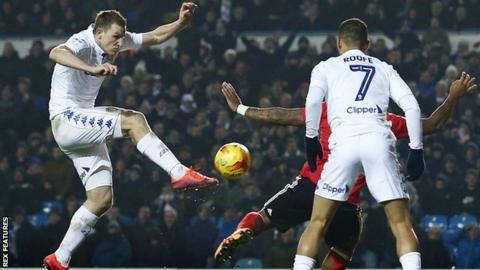 Chris Wood's 20th goal of the season helped Leeds United to victory over Nottingham Forest, which took them up to third in the Championship. New Zealand striker Wood finished from close range after Forest failed to clear a corner for his sixth goal in his past four league appearances. Souleymane Doukara netted a stunning 20-yard volley to seal the win. Forest went closest at 0-0 when Britt Assombalonga forced an excellent save from goalkeeper Robert Green. An entertaining game was short on clear chances until the visitors were made to pay for two lapses in concentration at set-pieces. Forest, who stay 19th and five points above the relegation zone, fell to their first defeat since Philippe Montanier was sacked and Gary Brazil was placed in interim charge on 14 January. Leeds climbed above Reading and Huddersfield in the table and they are seven points behind second-placed Newcastle, having played a game more then their promotion rivals. Garry Monk's side have won 10 of their 12 Championship games at Elland Road since losing to Huddersfield on 10 September, their only defeat in that time being against Newcastle in November. Leeds have also kept six successive clean sheets at home in all competitions. Leeds head coach Garry Monk told BBC Radio Leeds: "Credit to Forest in the first half - their game plan to slow the tempo was lowering our intensity and pace of play, which was making it difficult for us and making it a much more even game. "I said at half-time that we needed to up our intensity and we made a couple of tweaks. We looked very dangerous, controlled the second half, scored two really good goals and could have had a few more. "The pleasing bit was that we bounced back from a defeat. It's something that we talked about in pre-season, something that we felt was important as a group - if we suffer a defeat, we make sure we react straight away. That was the pleasing bit because that was the most important bit." Nottingham Forest interim boss Gary Brazil told BBC Radio Nottingham: "I felt in the first half we were the better team, we got ourselves a couple of good chances we didn't take, we defended well and played some good football. We knew our opponents, and knew they were in good form and handled it fantastically in the first half. "In the second half we lost tempo, it's something we'll work on, we need to maintain the tempo from the first half and we didn't, we fell away a bit. "We lost to a set-piece and a worldie goal. I didn't think there was much in the teams at all, there was a lot in the performance to be pleased with, we need to get fitter and we know we need to keep working on the training ground." Match ends, Leeds United 2, Nottingham Forest 0. Second Half ends, Leeds United 2, Nottingham Forest 0. Attempt blocked. Eric Lichaj (Nottingham Forest) left footed shot from outside the box is blocked. Corner, Nottingham Forest. Conceded by Luke Ayling. Eric Lichaj (Nottingham Forest) wins a free kick on the right wing. Attempt missed. Kemar Roofe (Leeds United) right footed shot from outside the box is close, but misses to the left. Assisted by Chris Wood. Offside, Leeds United. Luke Ayling tries a through ball, but Chris Wood is caught offside. Foul by Thomas Lam (Nottingham Forest). Substitution, Leeds United. Alex Mowatt replaces Pablo Hernández. Attempt missed. Chris Wood (Leeds United) right footed shot from outside the box is high and wide to the right. Corner, Leeds United. Conceded by Daniel Fox. Substitution, Nottingham Forest. Ben Brereton replaces Britt Assombalonga. Substitution, Leeds United. Ronaldo Vieira replaces Eunan O'Kane. Goal! Leeds United 2, Nottingham Forest 0. Souleymane Doukara (Leeds United) right footed shot from outside the box to the top left corner following a corner. Corner, Leeds United. Conceded by Daniel Pinillos. Attempt blocked. Chris Wood (Leeds United) right footed shot from outside the box is blocked. Hand ball by Daniel Fox (Nottingham Forest). Offside, Nottingham Forest. Ben Osborn tries a through ball, but Britt Assombalonga is caught offside. Attempt missed. Britt Assombalonga (Nottingham Forest) right footed shot from outside the box is high and wide to the right. Assisted by Thomas Lam. David Vaughan (Nottingham Forest) wins a free kick in the attacking half. Foul by Britt Assombalonga (Nottingham Forest). Substitution, Nottingham Forest. Nicklas Bendtner replaces Jamie Ward. Attempt missed. Stuart Dallas (Leeds United) right footed shot from outside the box is close, but misses to the left. Assisted by Gaetano Berardi. Offside, Nottingham Forest. Jamie Ward tries a through ball, but Britt Assombalonga is caught offside.